A Florida Green Lodging Hotel, the Springhill Suites Orlando Convention Center is smartly designed for the savvy traveler. Our studio suites make every stay a pleasure. 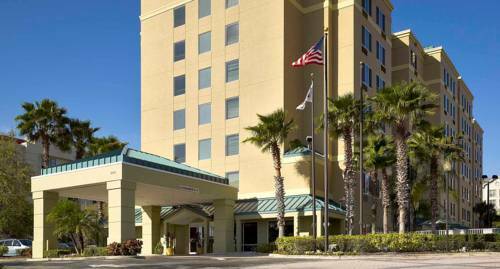 This Orlando hotel is a short walk to the Orlando/Orange County Convention Center and unique restaurants and attractions in the International Drive resort area. Take advantage of our free scheduled shuttle to the Walt Disney World Theme Parks. Feel at home in our spacious suites that include a sofa bed, mini-refrigerator, microwave, coffeemaker, free high-speed Internet and free local calls. Stay fit in our on-site fitness center, get started with a complimentary NEW breakfast and don't miss our outdoor heated pool with play fountain, enjoyable all-year long thanks to great Florida weather. For business, we'll help with the details by offering fax/copy services and an on-site business center. At the SpringHill Suites Orlando Convention Center, we put a refreshing look on business and leisure travel. - Disney's Typhoon Lagoon . - Disney's Blizzard Beach .